Kids in Parks teaches local natural history and ecology to students through hands-on exploration and study of urban parks. 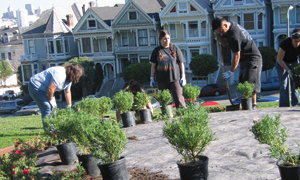 Kids in Parks has deepened the environmental knowledge and vocational skills of thousands of students throughout the Bay Area. The mission of Kids in Parks is to help disadvantaged public school students understand their roles in the natural world by studying and exploring parks and open spaces throughout the San Francisco Bay Area. Since its inception Kids in Parks has provided environmental education to more than 5,000 underserved students in the city, approximately 34% of whom are Asian American, 26% Latino, 18% African American, 15% Pacific Islander, and 7% Caucasian. Nearly 70% of the students qualify for subsidized school meal programs due to their low-income status, and more than 10% come from special education and special needs programs. Visit the Kids in Parks Website. Donate to Kids in Parks.